Flow of communication and information from the research station to the end user is sine qua non for the sustainable production as well as productivity enhancement in inland fisheries and the development of fishers as a whole. 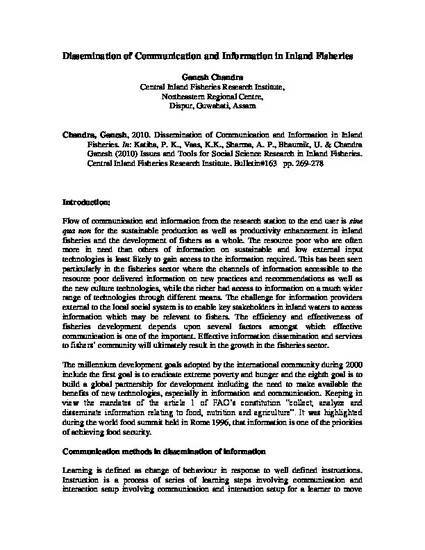 The resource poor who are often more in need than others of information on sustainable and low external input technologies is least likely to gain access to the information required. This has been seen particularly in the fisheries sector where the channels of information accessible to the resource poor delivered information on new practices and recommendations as well as the new culture technologies, while the richer had access to information on a much wider range of technologies through different means. The challenge for information providers external to the local social system is to enable key stakeholders in inland waters to access information which may be relevant to fishers. The efficiency and effectiveness of fisheries development depends upon several factors amongst which effective communication is one of the important. Effective information dissemination and services to fishers’ community will ultimately result in the growth in the fisheries sector. A survey was made covering 106 beels in 21 districts of Assam in 2005-07. Based on the analysis a communication index was formed for three different methods of communication covering all 21 districts. An integrated research extension approach emphasizes the importance of interactive, mutual learning between formal and informal knowledge/technology system and stresses linkages with fish farmers so that they actively participate in technology evolution process. The knowledge and information and its media should be appropriate so that the information shall not be distorted and easily disseminated to the end users for its early adoption. For effective dissemination of technological information from its source (researcher) to the end users (fishers) a effective linkage between researcher, extension and fisher is highly required.